The Pioneer PL-12D was a very popular real world turntable in the 70's. It offered superb performance at a very reasonable price at the time. It is a belt driven turntable with a very robust motor, a decent tonearm and a solid chassis. The slightly negative aspect of it was the suspension system, which was not as stable as it should be. This has been modified by Jesus Agnew, who has completely rebuilt the suspension, using decoupling materials by Auralex Acoustics. The motor was also striped and rebuilt, along with the centre bearing and the tonearm bearings, which were all reassembled using modern high quality lubricants, to ensure stable performance. We purposely maintain a real world turntable in the mastering studio, so we can test the compatibility of reference acetates and test pressings with systems, that the average listener would have access to. 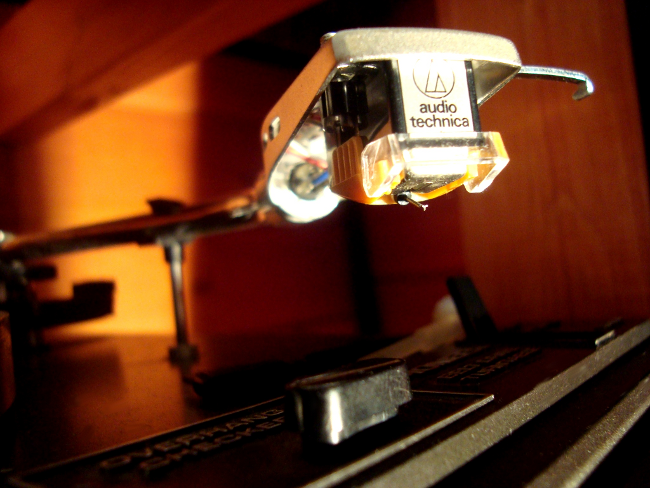 Coupled with an Audio Technica AT12XE cartridge, this makes a very decent reproduction system for most uses. We also keep a bunch of extra headshells with other cartridges, for when we have compatibility doubts.